Today’s video is a yummy Easter themed treat that the kids can help you make! 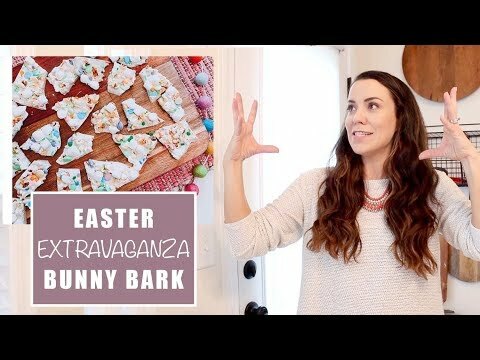 I’m officially calling it Easter Extravaganza Bunny Bark! Two things that I love… Holidays and Sweets! So combing two fo my fave things into this video for you guys! This recipe could not be easier and quicker. Hope you whip up this fun recipe with your crew! but you don’t want to deal with an oven or a big mess. I love that you can just do this whole recipe at the kitchen table. Melt the chocolate in a bowl and then pour it into the parchment paper lined pan you have ready…. Then just place on the kitchen table and let the kids go to town adding the toppings! that will make sure all the pieces stick together. Pop it in the freezer to harden real quick! I love no bake recipes… they just make life easy. it’s nice to have an easy recipe up your sleeve! Just break the pieces up into the size you want! Sometimes we use Oreos and pretzels… YUM. You can’t go wrong with this treat! Or perfect for wrapping up to gift to neighbors, classmates or family!